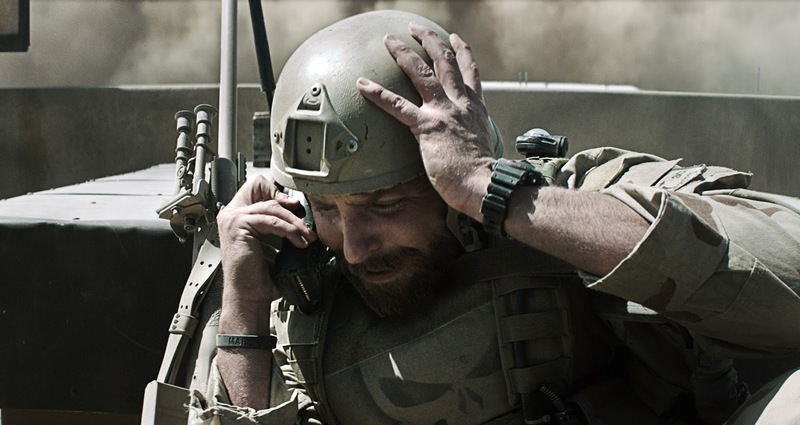 Actor/producer Bradley Cooper with his rising Hollywood clout has taken the burden upon himself to dramatize the real-life story of Chris Kyle (based on his memoir), a Navy SEAL credited as the deadliest sniper in American military history after four tours of duty in Iraq and 160 confirmed kills. Unfortunately, teaming up with legendary director Clint Eastwood has made for a largely paint-by-numbers, procedural approach to the non-fiction drama that underserves the dynamic material in American Sniper. As with most biopics, American Sniper has many of the usual hallmarks: boyhood flashbacks with a tough father, 9/11 imagery evoking patriotism and a call to duty, picking up the love interest (a very game Sienna Miller, who plays another real-life widow after Foxcatcher) at a bar, and the obligatory training montages. They're all executed relatively capably yet feel slightly hollow and beneath the compelling, timely material at hand. Jason Hall's straightforward script un-complicates Kyle to a fault, making him a dark but humble cowboy and family man torn from war. It's helpful Miller's performance in particular highlights Cooper's minimalist portrayal of the troubled soldier so well. Much has been made of the controversial aspects of Kyle's life not included in the film. His bizarre murder at the hands of another veteran with PTSD he was aiding, an altercation with Jesse Ventura, claims about killing Hurricane Katrina looters, and a roadside incident never materialize. It's this lack of a firm hold on exactly who Chris Kyle was that makes Cooper's admirable performance (and his Texas drawl) even more mysterious and evasive. Cooper and Eastwood succeed most when they deftly explore the individual human cost of war before and after through Kyle. American Sniper never becomes the more psychological drama it desperately wants to be as it settles for an assembly line made production. It feels light, despite the heavy subject matter, in the face of Kathryn's Bigelow's dual war films, The Hurt Locker and Zero Dark Thirty. The film simply doesn't fit and its portrayal of this singular man with a legacy of war never comes together, regardless of its fine performance.